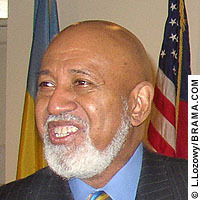 Copenhagen, 9 March 2005  The President of the Parliamentary Assembly of the OSCE, US Congressman Alcee L. Hastings, will lead the OSCE observer missions to the Presidential elections in Belarus on March 19 and to the Parliamentary elections in Ukraine on March 26. Congressman Hastings, a Democrat from Florida, will act as the Special Co-ordinator of the OSCE Chairman-in-Office, Belgian Foreign Minister Karel De Gucht. As the Special Co-ordinator, Mr. Hastings will deliver the preliminary conclusions of the International Election Observation Mission on the day following the elections. Mr. Hastings, who has extensive experience in election observation in the OSCE area, will lead both OSCE PA delegations, including the more than 120 parliamentarians and senior parliamentary staff who have been appointed to observe in Belarus. As directly elected officials, parliamentarians apply their unique knowledge of electoral processes to assess the conduct of the elections and the political campaign, in relation to OSCE commitments. In addition to receiving briefing reports and regular updates on the campaign process, the OSCE parliamentarians will receive direct briefings in the days prior to the elections with senior OSCE experts, as well as political, media and civil society leaders in the two countries. On election day, the observers will be deployed to polling stations to observe the sealing of ballot boxes in the morning, voting during the day, and the counting of ballots in the evening. Since 1993, the OSCE PA has deployed over 2000 parliamentarians to observe 75 elections across the OSCE region. The OSCE election observation missions are joint efforts of the OSCE PA and the OSCE Office for Democratic Institutions and Human Rights (ODIHR). The ODIHR deploys long-term missions several weeks before election day, as well as short-term observers seconded by OSCE participating States, and provides the framework for the deployment of the short-term parliamentary observers. In Ukraine, the OSCE PA will also work in close co-operation with parliamentary observers from the Parliamentary Assembly of the Council Europe, the NATO Parliamentary Assembly and the European Parliament. The Parliamentary Assembly of the OSCE, created by the CSCE Summit in Paris in 1990, is the parliamentary dimension of the 55-nation Organization for Security and Co-operation in Europe. The primary task of the 317 member Assembly is to facilitate inter-parliamentary dialogue, an important aspect of the overall effort to meet the challenges of democracy throughout the OSCE area. Copyright © 1997-2011 BRAMA, Inc. All rights reserved. The images and information contained in BRAMA News and BRAMA Press reports may not be published, broadcast, rewritten or redistributed without the prior written authority of BRAMA and/or author/photographer. The views and opinions of authors expressed on Brama.com do not necessarily state or reflect the views of Brama - Gateway Ukraine or its officers, directors or associates.